Ever since the Grow Green book came out this year I’ve been pining after a batface cuphea. I’ve looked all over the place with no luck. I talked to someone who bought one at the Zilker Garden Festival, but I didn’t make it this year. 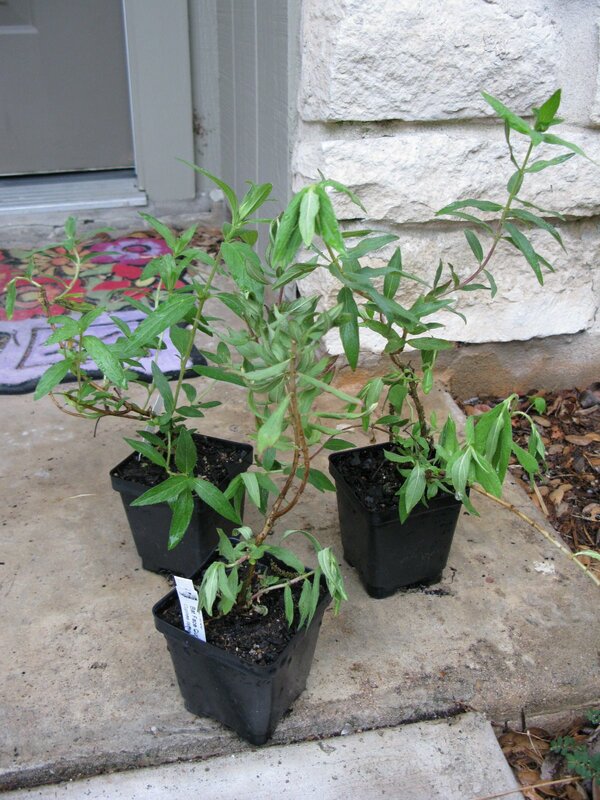 Then last week I talked to a friend of mine, a casual gardener, who had recently planted three batface cupheas. That is just not fair! She shared with me that they had several at the Red Barn in North Austin. I drove up Friday during my lunch break and was able to find some. They aren’t flowering yet, but I was told they are fast growers. Now I just have to figure out where to plant them. We had guests over for dinner on Saturday night and I decided to make goat cheese stuffed squash blossoms. I grabbed several from the garden Saturday morning, but as I started to put them together I realized that I could use a few more. As I started opening the newly gathered blossoms one of them was buzzing. I peaked and saw a bee inside. 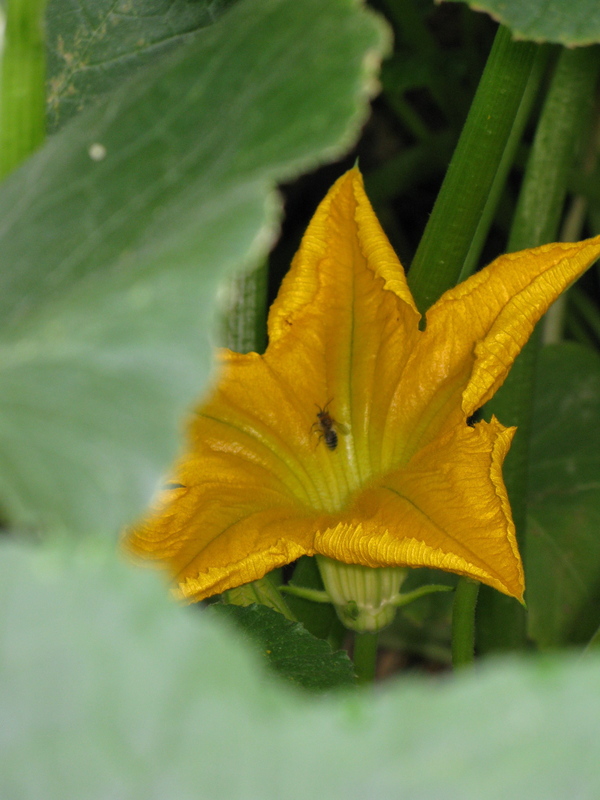 I immediately moved towards the door to throw the squash blossom outside, but before I could, the bee escaped. I screamed, threw the blossom, and yelled to my husband that there was a bee in the house. He seemed less concerned than I was. Well after I had a chance to collect myself I went for the blossom, since you don’t want to waste a perfectly good squash blossom. As I picked it up, a bee flew out. I screamed and threw it again. I was then very confused, I could have sworn I saw the bee fly out. Turns out there were 2 bees in that squash blossom. Luckily they flew to the sunroom and were buzzing around the windows. After about 10 minutes of coaxing I swas able to return those bees to the outside. Maybe that’s why they say to gather the blossoms in the morning. On a side note, I also made pesto with the garden basil and cooked up some zucchini and yellow squash. Yum! 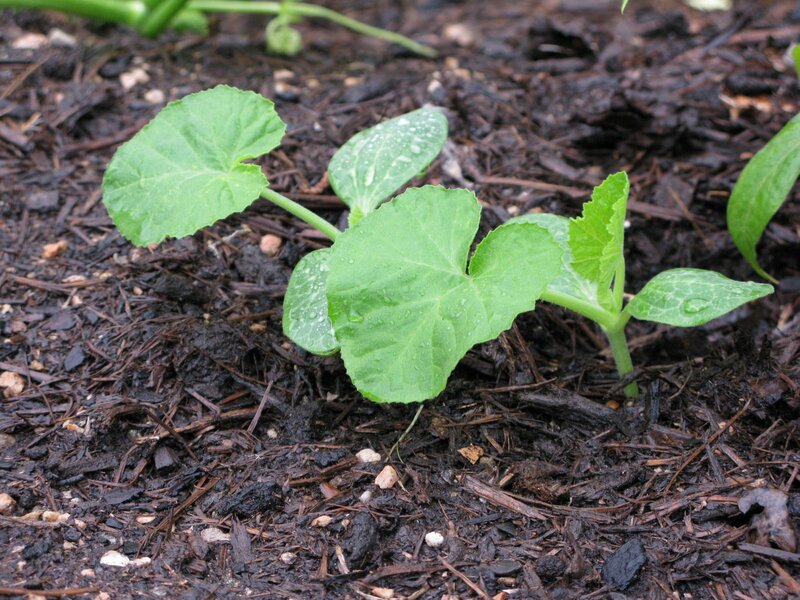 On to the mysterious sprouts… For the past several weeks I’ve seen what I swear are squash and tomatoes seedlings. I could be wrong about the tomatoes, but the squash family is pretty distinct. I couldn’t figure out how these were getting everywhere, especially in the back yard. Finally I figured out that I had used homemade compost in the recent plantings. The compost must not have been hot enough to kill the seeds, so last seasons veggies were sprouting in the garden. I guess this is why you’re supposed to avoid weeds in the compost pile. A few squash plants are much easier to deal with than milkweed. >I saw quite a bit of Batface cuphea at Shoal Creek nursery yesterday! But of course, that could mean it is gone today the way plants seem to disappear as soon as you want more. I planted some in the fall of 2007 and it is now starting to bloom really nicely. I have them in morning sun, afternoon shade. I am a new gardener and just kind of took a guess at where to put them! >I made two mound plantings early this spring, using compost from two piles and then adding garden soil from Natural Gardener on top…both of them are covered in squash…not intended! I think the compost has to get very, very hot to take out squash seeds! Your dinner menu sounds lovely! >Glad to know I’m not the only one w/ squash everywhere. The ones I planted on purpose are more than enough.